Do you get worried over the high cost to buy Oki B4520 toner at the moment? We've got a low price promise which means our toner for the Oki B4520 laser printer are seriously affordable. Forget about paying pricey high street price tags. Putting up with a bad quality Oki B4520 toner cartridge isn't a good idea. Because of this, we give you our full guarantee so there isn't any reason to be left disappointed. At Cartridge Save we aim to save you money without sacrificing on print quality. Place your today with Cartridge Save and save money! The handy Oki B4520 is ideal for small offices with limited spaces. This compact unit is a multifunction laser printer that is capable of delivering professional and crisp output. 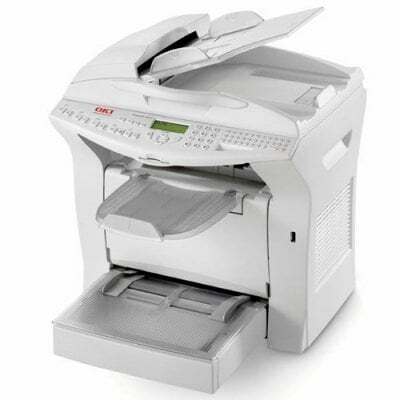 The Oki B4520 MFP has a fax machine with SMS capabilities, a copier, and a scanner. It can deliver prints with a maximum resolution of 600 x 600 dpi. The Oki B4520 laser multifunction printer can deliver 12,500 pages per month. This B4520 mono laser printer is only compatible with Windows computers. The all-white Oki B4520 printer has an ADF and flatbed. The control panel features a monochrome LCD display, function buttons, and numeric keypad. The input tray can handle 250 sheets and an optional 500-sheet tray is available. The Oki B-4520 black and white laser printer measures 455 x 520 x 445 mm and weighs 15 kg. For connectivity, a USB and parallel ports are available. Setting up and operating the Oki B4520 mono laser multifunction printer is very easy. This user-friendly unit offers a reliable fax machine that can also send and receive SMS messages from mobiles. The B4520 multifunction printer comes with an automatic document feeder and an automatic duplexer to help save resources. The Oki B4520 laser printer delivers consistent and solid output of monochrome texts and graphics plus good coloured scans. The high capacity Oki B4520 toner ensures that cartridge replacement is less frequent and less costly for the user. The B4520 MFP printer could be better if it had networking connectivity options. Print speed is rather slow at 20 ppm, there are inkjet printers that can deliver output faster than the Oki B4520. Macintosh and other operating systems like Linux are not compatible with this device.